Alan Moore & Kevin O’Neill return for the finale to their 17-year journey through the world of The League of Extraordinary Gentlemen, with The League of Extraordinary Gentlemen, Volume IV: The Tempest. The League of Extraordinary Gentlemen, Volume IV: The Tempest, will format as a six-issue miniseries, with 32 full-color (mostly) pages each. After an epic seventeen-year journey through the entirety of human culture – the biggest cross-continuity ‘universe’ that is conceivable – Alan Moore and Kevin O’Neill will close both their legendary League of Extraordinary Gentlemen and their equally legendary comic-book careers with the series’ spectacular fourth and final volume, The Tempest. 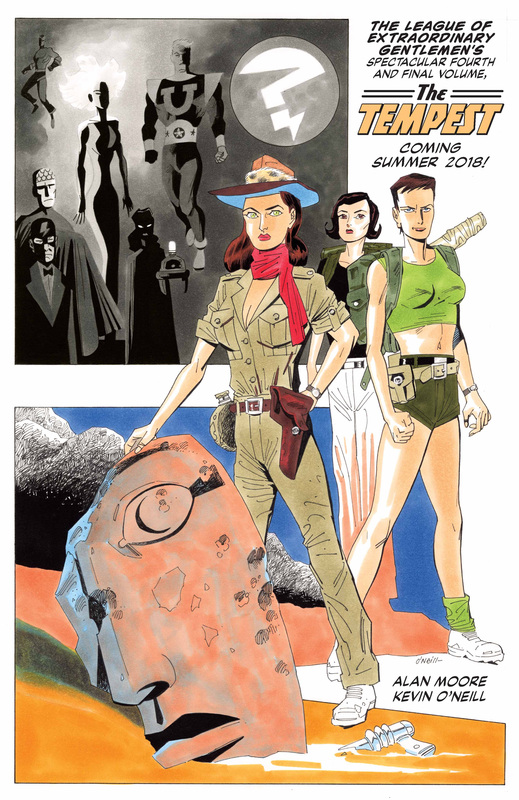 The League of Extraordinary Gentlemen, Volume IV: The Tempest will be 32 pages be saddle stitched, 6 5/8” x 10 1/8” (standard comic-book size), and priced at $4.99 (US). Issue #1 is scheduled for June 2018. Issue #1 is scheduled for June 2018. EDITOR’S THOUGHT: It’s going to be a long impatient wait for me. I remain a huge fan of The League of Extraordinary Gentlemen world, and the enormous amount of thought and attention put into this by Moore and O’Neill (and a top favorite of Alan Moore’s work). The wait will be long, but I think worth it.